Peppermint Oil For Fleas - Is It Safe For Your Dogs And Cats? 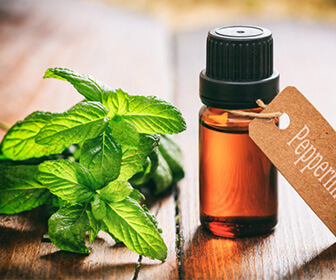 For many centuries, peppermint oil has been used as a natural pest repellent and is an ingredient used in many insect sprays, so it makes sense that many wonder if it can be used for flea control. If this sounds like you, you are in the right place, as I will cover everything you need to know about using peppermint oil on your dogs and cats. Is peppermint oil a viable solution compared to commercial flea products? Is this type of oil safe for your pets or are there any dangers? Does this remedy actually work and will it kill the fleas on your pets? How to use peppermint oil on your pet to keep fleas away (4x options). A couple tips for using this oil in your home for effective flea control. Why not use a commercial flea treatment for fleas instead of peppermint oil? While there is definitely situations that call for things like spot on treatments, etc, more and more animal lovers are determined to move away from these potentially harmful products and preferring to learn more about using natural remedies where possible. You will discover from reading this article that there are dangers inherent in using peppermint oil (more below), but if it is used correctly and diluted according to the recipes that I give you later in the article, it can be very useful in fighting the war against fleas. Is peppermint oil safe to use on pets that have fleas? As caring pet parents, we are always looking for safe and natural ways of taking care of our furry family. The popularity of using essential oils to attack the problem of flea infestations has become very popular, especially for those that like the DIY approach. However, sometimes “natural” does not always mean “safe”, especially when using them on animals. In the case of peppermint oil, here are some guidelines for using it safely. Using peppermint oil on cats: Putting it bluntly, personally, I would NOT recommend using peppermint oil on your cat! Even though I’ve come across quite a few stories where kitty cats have munched on a stolen mint candy or a few mint leaves from the herb garden with no ill effects, I feel the risks involved in using this oil on cats is just too great. Obviously, very low concentrations of oil may not pose too great a problem for your kitty but is it really worth taking a chance? If you want a natural DIY solution for flea control on cats, rather check out this guide on using coconut oil to kill fleas as a much safer option (it is very effective). Using peppermint oil on dogs: The key to safely using peppermint oil on your pooch is to make absolutely sure that it is never ever used neat and that you follow the dilution instructions carefully. This oil is very potent, and in reality, it can be harmful if not used correctly. However, when properly diluted it is very effective in fending off fleas on your dog. Also, always look for good quality organic peppermint oil when preparing the dilutions for use on your dog. Also, take care when using this oil on puppies or sick, pregnant or elderly dogs. Does peppermint oil actually kill fleas on your canine friend? As peppermint oil has long been used as an insect repellent logically, we would be interested in using it for getting rid of unwanted fleas. Let’s be clear, ‘repellent’ is the operative word here. This oil does not actually kill fleas but it’s great at keeping those critters at bay. It does, however, kill the much more vulnerable flea larvae which really helps to ward off flea infestations. By applying this product on your dog using the different options that I will explain later, you will make sure that fleas will keep a wide berth from your dog, as they repulsed by the smell of the oil. Let’s get down to some practicalities and give you some really useful options in using this oil to give your pet a fighting chance of fending off those fleas. See which method works best for you and observe how your dog responds to your choice, keeping in mind that some are more sensitive to the smell of the oil than others. Don’t forget that your amazing pooch has up to 300 million olfactory receptors in their noses, whereas we have only about 6 million and peppermint oil smells strong. Please remember to repeat the steps (from the option that you chose) at least once a week, as by then the odor of the oil will have dissipated and your dog will need another quick spray. Shake well each time you use your spray as the two oils will have separated when not in use and the dilution will no longer be accurate. PRO TIP: If you want to go the extra mile and have a couple other essential oils on hand (or can go get them), you can add 5 drops of rosemary oil and 5 drops of lavender oil to the mixes mentioned below. It must be said that this is not necessary, as peppermint alone is enough to keep fleas away. However, this mixture will boost the effectiveness a little bit. This method is one of my favorites, as I love the convenience of making this in bulk and keeping it in the cupboard for regular use. I recommend that you purchase a sturdy spray bottle before you start (nothing too expensive though) as working with those low-quality ones is a nightmare. Step 1: Using a spray bottle, mix 1 part of peppermint oil to 12 parts of a carrier oil like grapeseed oil or neem oil (e.g. 1x tbps of peppermint oil to 12x tbps of carrier oil). 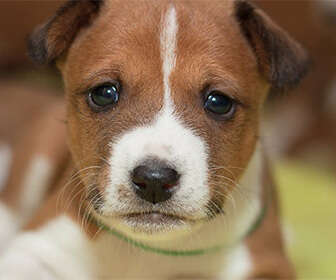 If you have a small breed dog, use half a tablespoon to 12 tablespoons of carrier oil. Step 2: Shake vigorously to ensure that the two oils are mixed thoroughly. This is a crucial step as the carrier oil and the essential oil need to be very well blended to ensure that the dilution is correct and ready to apply to your dog. Step 3: Spray your dog carefully, avoiding his face and nether regions – peppermint oil can have skin irritating and cooling effects when it comes into contact with delicate skin, and your pooch definitely won’t appreciate any burning sensation in sensitive areas! If you are not a fan of spraying (some dogs hate it), then this method is for you. Go the extra mile and get yourself some organic cotton, it is usually pretty cheap. Step 1: Make your peppermint oil and carrier oil solution as explained in the previous option, remembering to make sure that the two oils are very well blended. However, this mixture can be made in an ordinary bottle as you will not be using it as a spray. Step 2: Use a ball of cotton wool that has been dampened with the mixture (squeeze out any excess oil, you don’t want it to be too wet) and dab areas of your dog’s body. Behind his ears, the back of the neck and on his back are favorite zones for fleas, so take a little extra time and treat those areas carefully. Step 3: Once again, shake up your mixture and repeat at least once a week to ensure that those hideous fleas stay far away from your furry friend. Although this is not as effective as the other methods due to its limited coverage (only around the neck), it’s still a great solution and does work, especially for dogs who are always in the garden. If your dog doesn’t have a collar, you can use a makeshift bandana as they are very cheap. Step 1: Make up your peppermint oil mixture using the same dilution as in option 1 (1 part peppermint oil to 12 parts carrier oil, using less peppermint oil for a small breed dog) ) in a container of your choice, making sure that they are thoroughly mixed. Step 2: Carefully apply the oil mixture to your doggie’s collar or his favorite bandana. Place around your pet’s neck, making sure that the treated side is at the back of his neck. You don’t want to overwhelm him with the peppermint smell right under his very sensitive nose. Step 3: Reapply regularly, usually about once a week – You will know when to put on another dab of the essential oil mixture, just give your doggie’s bandana or collar a sniff to check whether the peppermint smell is beginning to fade. There are a few other tips that I would like to share with you that are really useful to know when using peppermint oil to drive fleas away from your pet and your home. If you have any other suggestions, let me know in the comments section and I may add a couple to this list. Place a cotton ball with a few drops of peppermint oil on it into your vacuum cleaner. The smell of the oil will repel fleas and any larvae that happen to be so unlucky as to be sucked up will be obliterated. That will ensure that you are also preventing any chance of newly hatched fleas from attacking your pooch. Instead of mixing your peppermint oil with a carrier oil, use plain water to use as a spray around your house. This mixture needs to be well shaken as oil and water don’t mix easily. This solution can then be sprayed on kitchen surfaces and in any of those hard to reach corners of your house where those little fleas like to lurk. Put a drop of peppermint oil into a full bottle of doggy shampoo. Remember to protect your dog’s ears by putting some cotton wool in them and don’t get the shampoo into his eyes. He will have a lovely fresh smell and those will fleas will stay away for days. This is something that I have been doing for years, and I highly recommend that you give it a try. Although not directly related to peppermint oil, if you have read this far I feel that you are an advocate for natural solutions, and a common question that I get from readers is “what about flea control in the garden?”. If fleas have taken over your yard, I suggest that you try using beneficial nematodes to kill them. They are cheap and don’t harm any useful insects like ladybugs, etc. Peppermint oil is most definitely a valuable resource in our arsenal against the dreaded invasion of fleas on our pets and homes. By using the diluted spray in and around our homes or using the methods that I’ve shared with you on your pet creates a great barrier against flea infestation. The old saying – prevention is better than cure really applies when looking at the benefits of using Peppermint oil to repel fleas. Thank you for reading this article and I hope you enjoy putting some of my suggestions into practice. Who knows, maybe we’ll be seeing more and more pooches sporting fabulous bandanas with a cool, fresh minty odor wafting around them. 🙂 Looking forward to hearing about your experiences in using peppermint oil for fleas.